…..I have been asked to review what I have heard today and suggest some key themes and actions that will help moving forward on the agenda presented by today’s speakers about what will be needed to shape the recapitalisation of the pastoral industry in western Queensland. 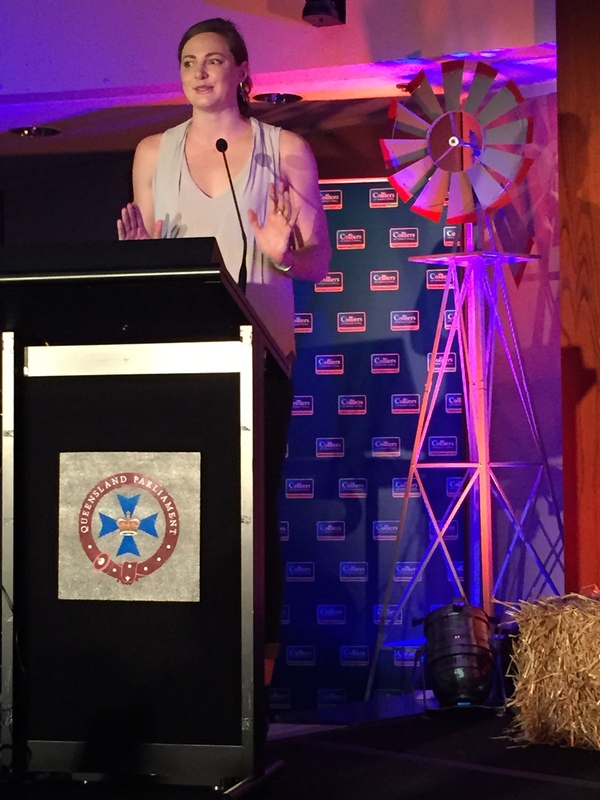 What a great start to the day it was hearing Olympian Cate Campbell reflect on what it took to reach the very pinnacle of her sport. What stood out for me was Cate’s absolutely disciplined commitment to success, matched by her wilingness to innovate in her training regime, to try new things and prevail, sometimes in the face of critics who kept to a more orthodox view. Instead of just swimming along the long black line at the bottom of the pool Cate and her coach follow a regime that is strategic with very clear performance benchmarks and goals in mind. Much of what we’ve heard today is part of an emerging consensus on changes that have to come if Australia’s rural sector is to make the most of future opportunities. When I think of the future what comes to mind is that acronym ‘VUCA’ – Volatility, Uncertainty, Complexity and Ambiguity. And I suggest we have to keep that in mind because today I certainly heard distracting calls for the “silver bullet” solution, that is, government intervention and initiative to provide facility and certainty. Achieving the facility outcome is feasible, delivering on certainty is not possible. The issues that confront Australian agriculture, particularly in marginal rangelands like western Queensland, are complex and the future will always be uncertain. And indeed if I think of one thing all of us would agree on it is that the issues of drought and farmer emergency are quite different to the longer term structural and sectoral strategic issues we have canvassed in this forum. The power of one times many – we can all make change happen. It was Ben Cameron from Bentleys Agribusiness who said that “west of the Great Dividing Range it was Armageddon and on the eastern side they were all pigs in mud”. That simple description starkly contrasted operating conditions in different parts of Queensland and it reminds us that there is no one size fits all to an industry that spans the continent. In a big country like Australia someone somewhere is getting rain and elsewhere someone is in drought. So we need to be quite specific and clear about who and what it is we are talking about when we talk of sector reform and innovation. Indeed because as Shadow Minister for Agriculture Deb Frecklington admitted earlier this afternoon, “government cannot be the fix-all for everything”, rural industries have to be much clearer and more realistic about what they expect of government. I think it was Thomas Jefferson who said “Government is the last resort of civilised mankind,” not because he wished to trivialise the vital function of government, but because government should only attend to the most important things that by ourselves we cannot do for ourselves. But here in Australia we still tend to see government as ‘the great commissariat’ to which to we attend for sustenance and direction. It is an historical overhang which Australians should not let define or brand us further. We can help it best focus its resources for regions by having clear priorities ourselves. What are the priorities expected from different levels of government and how in some cases, like the northern Australia strategy, would we like to see the three levels of government cooperate? A delegate spoke of the need for digital infrastructure and efficient communications in the bush and she is right. One of the essentials we need from government is basic enabling infrastructure and there is nothing more important than affordable efficient digital infrastructure for regional Australians. In a number of graphic examples speaker Tim McGavin also reminded us of the importance of government getting rid of perverse policies and regulation that discourage investment and actually achieve the opposite of employment and economic growth by diminishing business opportunity, degrading efficiency, and minimising markets. So let us not be distracted from the core issues. Effective engagement is fundamental – engaging with new markets, new sources of investment, and importantly with urban voters who are the main shapers of the national body politic. I remember a decade ago being at a talk given by then Opposition Leader Mike Horan who was acknowledging that the challenges for rural MPs would only get more difficult as time went on because the number of people living in cities continued to increase at the expense of the regions. The demographics of rural electorates are not encouraging. They keep diminishing. Recently we saw here in Queensland the LNP Opposition attempt to legislate for four new regional seats only to be rebuffed by the metropolitan dominated ALP Government. Farmers improving their numbers in Parliament is simply not going to happen. So this idea that we can advance the interests of the rural sector simply through the efforts of elected political representatives from regional areas doesn’t stack up. We will need the political buy-in or people in the cities to succeed in promoting the strategic importance of the food and fibre sector and viable rural communities. Years ago when one of my younger Brisbane colleagues was unable to identify the location of a SEQ regional centre just 75 kms west of the capital, it struck me then that regional Australia really had a problem in registering on the radar of city born and bred people. A generation of globetrotting metro Australians is growing up without the slightest knowledge of rural and regional Australia and that lack of knowledge is matched seemingly only by their lack of interest. There is much to be done in re-calibrating and re-setting the mainstream understanding of rural issues. Firstly, the image that people have of Australian agriculture of course is romantic and not realistic. And it finds expression, for example, in drought policy which has been pretty much unchanged since the 1930s. Drought policy is still all about emergency and politicians running to the rescue with taxpayer funds to bail out struggling farmers – irrespective of what party is in power. I am not blaming farmers for the lack of innovation in drought policy, but I am suggesting that drought relief payments are seen as a form of rural welfare which is not helping change the way people in the cities, including asset fund managers, perceive farming and farmers. In pitching its message to government and the broader community, at times the farm sector seems and sounds a bit schizophrenic. The dominant images of rural Australia city people see on the 6 o’clock news are short snippets of drought, rural desperation and despair. Can I suggest that those images, real and as compelling as they are in some quarters, are not helping the rural brand in mainstream middle Australia? And it certainly does little to underscore a politically palatable proposition suggesting Australian agriculture is highly investable going forward. I think it is quite possible that those domestic super funds that don’t invest in Australian agriculture, (putting aside their risk formula and expectations of short term return) are being influenced also by the dominant urban view of farming as risky and unattractive. Fortunately, foreign investors have no such inhibition and yet the prospect of “selling the farm” to overseas interests sends tremors through the national psyche and results in political veto of major commercial development of the kind we know is needed to effectively capitalise the sector. On the domestic front if mainstream urban Australians are to be more effectively engaged in the cause of rural development, farming Australia has to be out there more vigorously promoting the examples of its success. Professor Steve Raine from the University of Southern Queensland who heads our Institute for Agriculture and Environment is here today. His researchers are doing amazing things in state-of-the-art irrigation, robotics, automation, drones and the like – innovation worth hundreds of millions in agricultural productivity. They are but a small part of the enormous investment being made in technology in the farm sector presenting a picture of high tech innovation that challenges the stereotype. The truth is agriculture remains one of the smartest Australian industries and one of our most competitive internationally. And yet it is the image of the weathered skull of a steer in a desert paddock in western Queensland that captures the urban imagination. Real as that image maybe, it cannot be left to define our rural future. We should all be mindful of the great challenge of just getting clarity in the agri message. In making representations to government, leaders of agri-representative organisations like the NFF’s Brent Findlay here today have to align the interests of 60,000 farmers and 30 organisations within its membership. In contrast the Minerals Council of Australia probably has less than 10 key CEO decision-makers among its membership who need to be accounted for before that sector launches a campaign or targets a government as it did so successfully with the Rudd Government and the mining super profits tax. That’s the front end story. The back end remains back in Ben’s presentation and his talk of the debt levels of beef producers in regional Queensland. When you talk about having a debt to gross value of production ratio that makes Greece look like a model of financial rectitude, you have to say there are some fundamentally challenging issues there that are going to require innovation – and transformative innovation of the disruptive kind (not the incremental stuff). Come the rains farm financing strategies will have to be more robust than getting someone other than banks to put money into enterprises already overladen with debt. Undeniably there will be some consolidation. No one in this room needs to be reminded that agriculture operates in economic and ecological cycles. But as Bruce Gunn from the BOM acknowledged, when we talk about weather cycles shaping farming futures, we also need to deal with the big wheel of climate change and its uncertainties. I think everyone was heartened by Bruce’s suggestion that it looked like the El Nino was peaking this month and that there was some reason to be hopeful for some rain over the summer. Record prices seemed to be the common refrain when mention was made of re-stocking at a cost of about a million to one and a half million dollars for each 30,000 acres of country. 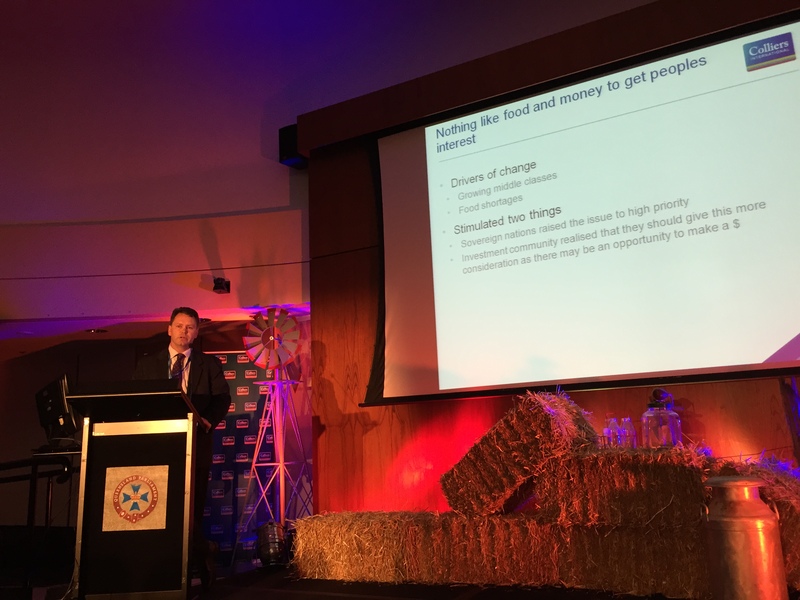 Bentley’s Ben Cameron reminded us first up today just how much the financials of beef cattle had changed in the past 12 months as production becomes restricted because of drought. Over morning tea, I heard a delegate suggest that farmers in other regions with cattle could possibly enter into forward contracts with producers in regions likely to see some recovering rains. Besides begging the question of how confident producers can be in the scientific information they receive from agencies like the BOM, this suggestion takes us to the issue of producer cooperation and the horizons that have to be attached to such activity. In the Kidworth Station case study, delegates will recall when the rains came and the Kidworths had some money and ambition, they bought their neighbour’s property in western Queensland. In so doing Bob and Marg Kidworth doubled their vulnerability to the climatic conditions in that region when more prudently they might have been better served by purchasing a property outside the region – or entering into a partnership with a producer similarly distant. In scoping enterprise level cooperation, Australian farmers should be thinking about arrangements that extend beyond one region. We can do that. It’s what Sidney Kidman did a hundred years ago. There are always some abiding lessons from the past to be re-learned. Collier Internationals chief value Shaun Hendy spoke of the challenges of re-stocking in a restricted supply setting because it will inevitably necessitate drought recovering producers securing capital from somewhere and paying top dollar for stock. 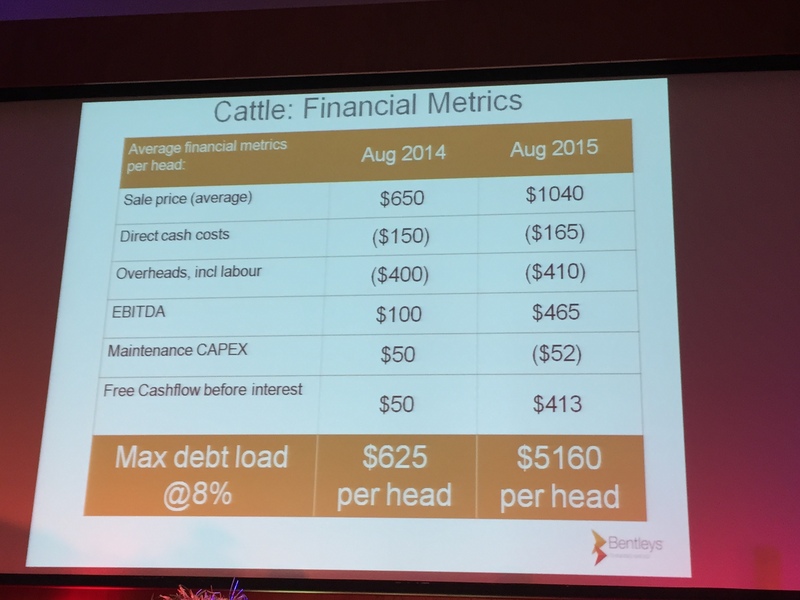 Some like James McLean from Allied Beef said that the issue confronting many producers was not so much debt, but generating cash flow – and by implication building capacity to service debt. This cash flow versus debt focus is a really crucial point because I am still trying to get my head around how a business which has a cash flow four years out of ten can be a sustainable proposition, unless it has revenue options outside the farm gate – or makes so much money when times are good as to see it through the bad times. Besides suggesting possible flaws in existing methods of asset valuation, it also begs questions about strategies for business diversification and how other opportunities in value creation might be initiated. 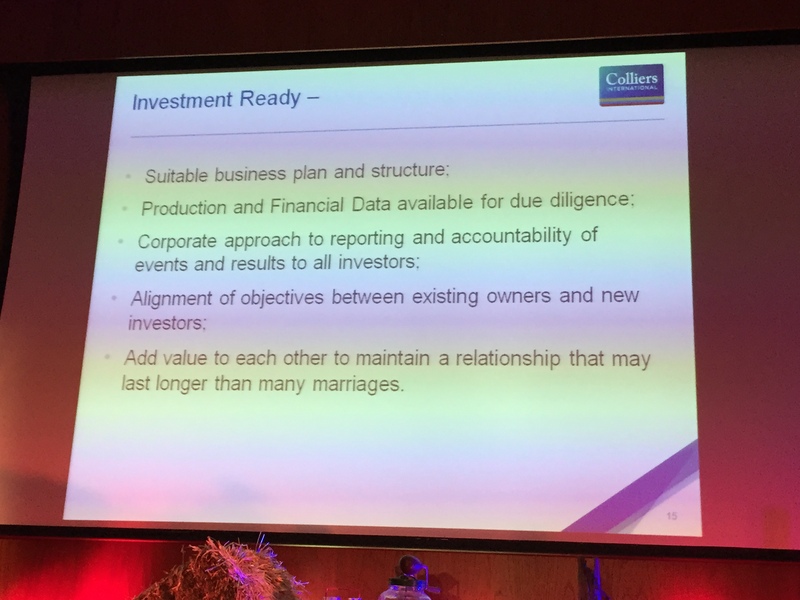 Shaun Hendy talked about the need for producers to be “investment ready” with the information, plans, and projections that investors, whether they be banks or equity sources, will want before making any commitment to fund. When it comes to diversification the challenge of maintaining asset value in the land and creating a sustainable rural is more problematic than improvising to pay bills during the drought through the likes of farm tourism. Don Chandler didn’t seem confident about a lot of producers being comfortable in promoting the level of innovation speakers today have indicated will be necessary for a future industry in western Queensland. So what are the longer term avenues for diversifying cash flow sources in rural and regional enterprises? Will we end up with a ‘drive-in drive-out’ pastoral industry depending on the stage of the climatic cycle? Certainly building cooperative capacity will be core to enabling business diversification for some producers. To that end there will be higher levels of professionalism expected of our producers as some, like Troy Constance from Suncorp Bank, suggested earlier. Today in our discussions we have confirmed that the horizons of change in the farming sector have to be set well beyond the farm boundary and include a range of factors and players conventionally excluded from consideration. It reminds me of the talk I gave to LGAQ Bush Councils recently around the theme of taking responsibility for your own future and working cooperatively. 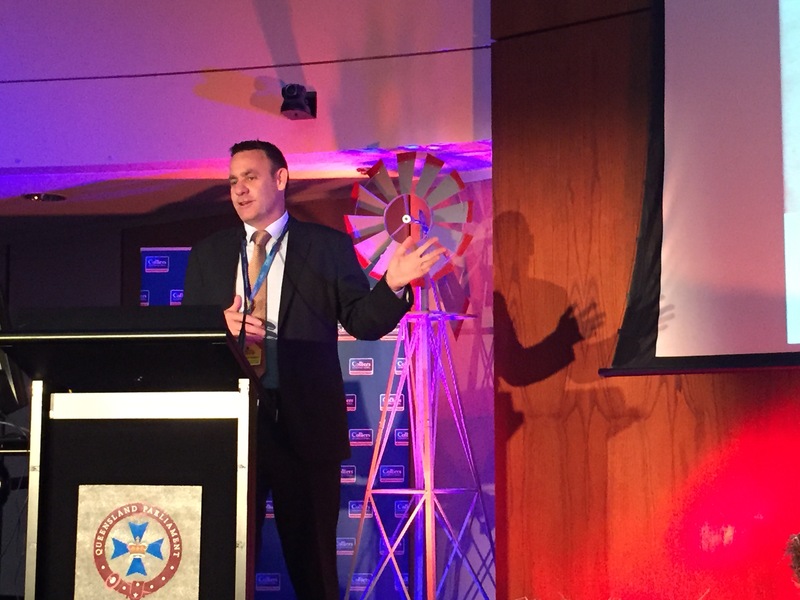 The Local Government Association of Queensland in itself reminds us of the power and potential of cooperatives – a $2 billion business which in itself is a classic example of cooperatives at work. So mindful of such powerful examples, we should not resile from working cooperatively. Palpably we can. Indeed through the afternoon while there was much talk about cooperation, but I didn’t’ hear the word “collaborate”. I can say that coming from a university while also being mindful that Australian industry derives something like a minuscule 3% of its innovation from universities. It’s no secret that we Australians don’t do ‘collaboration’ real well. It’s not just a sectoral issue, our inability to build collaboration between enterprises and between sectors is a national impediment to development that we must overcome. And I think it was Boyd down the back who got up and reminded us that while cooperation was a good idea, he was sceptical of farmers giving up on the prerogatives of ownership and control. And that begs that question of culture. We have to be honest with ourselves and acknowledge that ‘culture’ often stands in the way of collaboration and building business structures beyond the farm gate. Thankfully there are encouraging examples providing what collaboration can achieve. The other day in the Queensland Country Life, I saw a story about two large southern Queensland chick pea growers who had decided to collaborate and co-invest in their own rail depot to invigorate the efficiency of their harvest and reduce the risks of stockpiles being exposed to the weather. This is the alternative model that must prevail over the old culturally constrained narrow gaze that has meant also Australian farmers have missed out on opportunities to secure new sources of investment. Every speaker today has pressed the need for and the opportunity to partner with foreign investors. 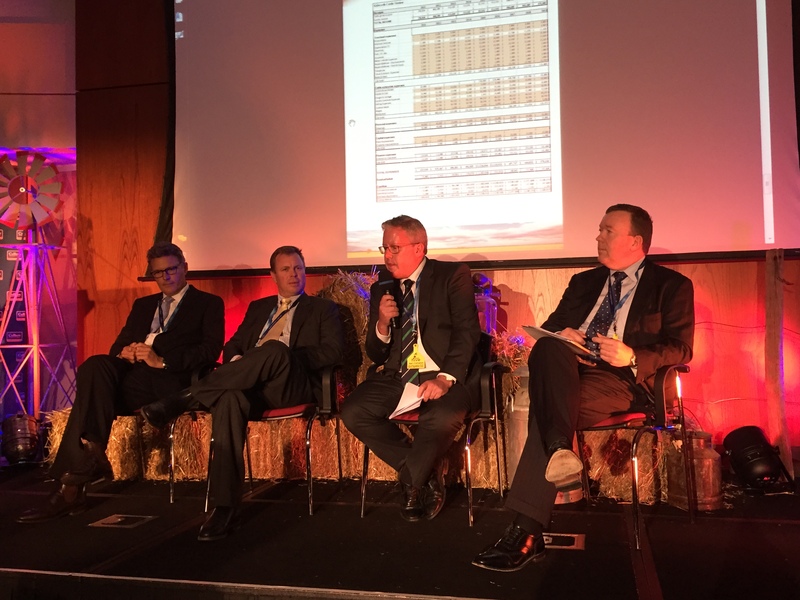 And more latterly in the day the panel focussed too on the emerging focus of the Australian superannuation sector on agriculture. Lamentably, with just 0.3% of its funds invested in Australian agriculture, our domestic pension funds have a long way to go to be underwriting the potential of our future farm sector. Indeed the indifference of the asset managers to country Australia leads me to return to that earlier theme of engagement, that is, how rural Australia engages with the great majority of Australians who live in the cities. I know I have traversed some fairly broad themes in this summary, but everything we talked about today is actually happening. That’s the encouraging thing. We are hearing about alternative sources of investment and new examples of cooperation. Today I don’t think we moved any closer in this forum to resolving the cash-flow issues of the ‘broke cocky’, because quite frankly, in many such cases the tipping point toward insolvency has been passed. And this is the crux of it, I guess, this idea of self-regulation, being able to do things for yourself, taking the initiative at your own volition – it is a key element of resilience. In talking to communities and local government, especially in regional Australia, one of my main messages is that we have to do more for ourselves and that is not something many people want to hear. Right now in western Queensland I am working with the remote area shires running workshops not on the drought but the future of central western Queensland and the ideas coming from people reflects not only the depth of human capital we have in our regions, but also their unyielding optimism for the longer term. And this takes us to the issue of farm succession which, as I said to Growcom yesterday, seems to be characterised by a mix of demographic factors ie aging farmers and low levels of young age entrants. Tim McGavin pointed to a cohort of smart young professional people who would come into agriculture if they could secure the capital to underwrite their vision. That being the case work is needed to match those people with the sources of investment and capital and the practical experience of farmers who wish to retire but still have much to contribute in practical production wisdom. The most important adaptive function of Australian agriculture is to facilitate the entry of the next generation of farmers. Turning to the emergence of new markets, it was the MLA’s Richard Norton who said that all roads would lead to China by 2020 – notwithstanding demand from the US, Japan and Korea. But we should also work to maintain diversity in our export markets so as to not to become vulnerable to just one market. 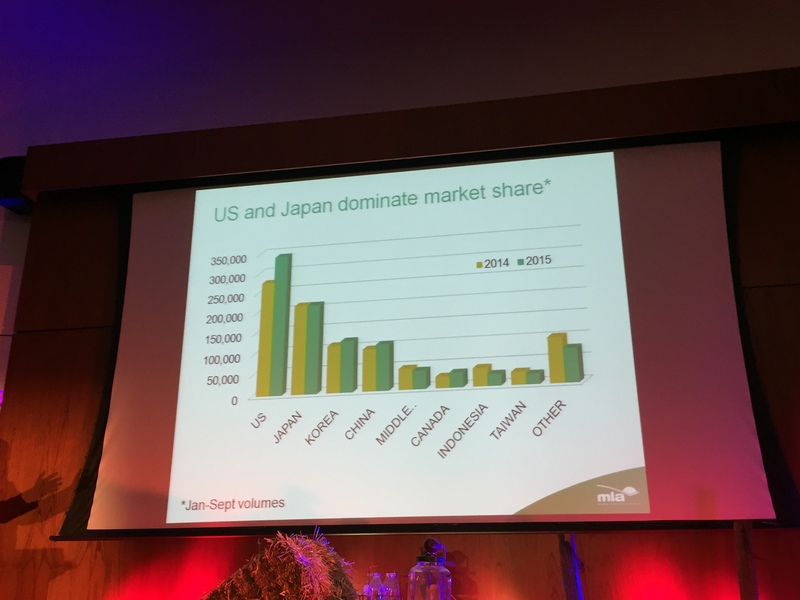 Richard Norton’s slide shows the US and Japan as dominant markets for Australian beef. Another key element of resilience by the way is diversity. Strategy for resilience needs options, because just like monocultures, single path strategies ultimately end at a brick wall. The most important thing about resilience is the capacity to change. And I still think we have some way to go there but I am encouraged by forums like this. My coming on board last year with James Walker happened serendipitously as a result of a mis-directed phone call between strangers. He told me about his plan for a CEO summit at Longreach to address industry issues related to the drought. I was so taken by this young man’s optimism and self-belief that he could make a difference through individual effort – that I got on a plane and went out to the summit and to learn more about his Agrihive initiative. For someone who has been around government and public affairs for as long as I have been, it is refreshing to meet people who still believe in the primacy of individual initiative and accountability. We need more people like James willing to ask questions, mobilise ideas and people and have a go. Each one of us today can take from this forum and do in our own place the things we have discussed as being necessary. We can talk to our friends and colleagues in industry and in the communities and advocate for greater enterprise-level cooperation, new sources of investment, savvier engagement with cities and consumers and so on. Importantly, individuals and initiatives like this forum must also engage with the formal apparatus of sector organisations because collective effort is essential in compounding individual initiatives into industry policy. Brent Finlay and the NFF as well as all the member organisations like Agforce are the fulcrum points for continuing development, advocacy and presentation of innovative ideas that lead reform. And I think again it is this collaboration thing. We have to look long and broad and James is to be commended for his initiative in looking beyond the farm sector for answers and input. That’s one of the great things about using the case study methodology borrowed from the Harvard Business School. The CEO Summit’s Kidworth Station case study presents information and context and then invites suggested strategies from different parties and points of view. It’s a great way to test a proposition, engender innovative thinking, and draw on the wisdom of the crowd – including those well beyond the conventional supply chain. The point of the case study is to generate analysis, discussion, and thinking that leads to actionable ideas. Agrihive is not an industry association nor is it a government department, so today does not have to artificially construct an agenda list or a communiqué. Its enough that the participants share ideas, knowledge and learn from each other. We leave here today knowing that for the most climatically variable region on the most climatically variable continent, the future means a warmer and drier region with drought a regular if unpredictable feature of life. In that future there are challenges and opportunities, winners and losers. For the things that need to be done to be accomplished, leadership and initiative is required. And it certainly requires thinking that goes beyond business as usual and a return to ‘the same old same old’ as soon as the rains come. Self-organisation starting at the farm enterprise level is where we start. And indeed with those concepts in mind and with strategies of the kind discussed here today, innovative development is possible. So thank you.